Never forget, that even though CeskyKrumlov is such a charming little city, it was still subject to the Middle Ages of Europe and even at the best of times, there were horrifying practices. 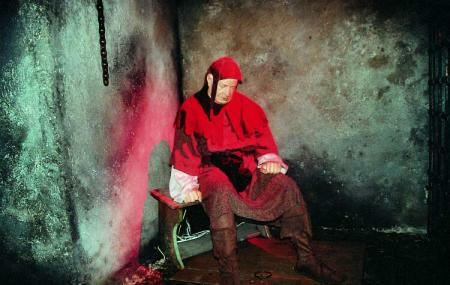 The small 400 square meters Museum, located in the basement of the Town Hall, has lifelike mannequins trapped inside the devices of most terrible torture. There are over 100 instruments, and one interactive exhibition actually demonstrates a witch burning complete with light and sound effects. Keep in mind, that while some of the exhibits may look silly, these were all real devices that seriously made life help for people in the past. Love this? Explore the entire list of places to visit in Cesky Krumlov before you plan your trip. Fancy a good night's sleep after a tiring day? Check out where to stay in Cesky Krumlov and book an accommodation of your choice. How popular is Museum Of Torture? People normally club together Graphite Mine and Minorite Monastery while planning their visit to Museum Of Torture. I was all alone when I entered the museum, maybe because i was just too early. You will descend into a cellar, under the police station. You will find lots of complexes with dioramas and wax sculptures depicting medieval tortures. Some of my favorite exhibits are the iron maiden and the chair of judas. I learned this museum from the movie Hostel, and it is actually set here in Cesky Krumlovand have shots in this museum. I also like the exit.. Great experience eapecially when you are with no one. There's no one else when I visited. Scary af. Reading the exhibition card is helpful for you to reduce your nervousness. I found it pretty cool. Kind of reminds me of a very well made haunted house. They show different ways they tortured and killed people as well as explanations of how it was done and to whom. I myself and my friend found it cool. Besides it wasn't expensive and if you're a student it's under 4 euros. A cool pass time after you visited the whole town if you take your time ro read and examine everything should take 30 min. Quite pricey for just a 10min walk inside the museum.